Career and Technical Education (CTE) is no longer just a training program for workers. CTE today prepares students for employment, industry credentialing, postsecondary education, and lifelong learning. This change, stimulated by demand and federal legislation, has brought many new challenges and opportunities for CTE. Federal legislation, CTE image, and decrease in secondary enrollment and in teacher education programs have created challenges and opportunities for all CTE stakeholders. In 2008, a National Career and Technical Education Research Agenda were approved by the Association of Career and Technical Education (ACTE). This agenda will be the framework for future research relating to the critical issues and concerns in CTE. This chapter addresses the challenges and opportunities for CTE as well as future trends. Unlike some academic areas, CTE must be in a constant state of change to serve all the stakeholders. Changes in labor market should drive constant and ongoing change in CTE. 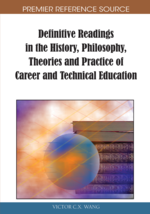 Attention must be paid to changes in the labor market and career-focused education must be redefined in response to emerging trends (Kazis, 2005). Abel (2006) discusses the book, The Jobs Revolution: Changing How America Works, and states that students should be equipped with concepts that relate to all problems, rather than specific job related problems. Just as we have witnessed tremendous changes in the labor market since 1917, so have we experienced tremendous changes in CTE. These changes provide new challenges and opportunities for CTE. The purpose of this chapter is to address the challenges facing CTE, as well as the opportunities that may thrive from the challenges. This chapter is organized using the following sections: background, challenges and opportunities, future trends, and a conclusion. The challenges include meeting the requirements of legislation, CTE image, and decline of CTE enrollment and teacher education. Early in the history of CTE, there was a need to prepare additional blue-collar workers for the nation’s farms and factories (Lynch, 2000). Today there are CTE academies that are viewed as a passage way to Ivy League schools. These academies may offer programs such as science and technology, engineering, medicine, business, telecommunications and computer science, culinary and hotel administration, and the arts (Hu, 2009). The years from 1982-1994 reflected a steep decline in CTE programs and enrollment. Programs were not viewed as meeting the needs of the students, employers, and communities. In addition, CTE programs were not considered an option for the college-bound students and the curriculum was judged as being weak. There was a perception that CTE would inhibit rather than enhance a student’s future (Catri, 1998). The goal of CTE today is to prepare students for employment, industry credentialing, postsecondary education, and lifelong learning.